These are quick refrigerator pickles, so DH has dubbed them “Quickles”. They can be made with any combination of fresh vegetables you like. They are a really healthy snack, and will add the vinegar and dill flavor to main meals, such as the Southwest Veggie Burger! They don’t really need any salt in the mixture if you use some Balsamic vinegar. Cauliflower Hot Quickles. Cauliflower, sweet onion and 1⁄4 fresh jalapeno, seeded and membranes removed. I added a few carrot slices to balance out the earthiness of the cauliflower. Original Dill Quickles: Cucumber, red onion, and a few slices of carrot. Orange Coin Quickles: Carrots and sweet onion. You will need a canning jar or two (depending on how much you make at one time.) A mandolin or automatic slicer, such as a food processor or salad shooter is handy if you’re going to make a lot at one time. The ratio for the pickling liquid is: 1 cup water + 3⁄4 cup vinegar + 4 tablespoons Stevia. I use Stevia in the Raw which comes in a “bakers” version, meaning it measures like sugar. If you are using a different sweetener, you will need to test for amounts. How much liquid you will actually need will depend on how many jars you end up making. 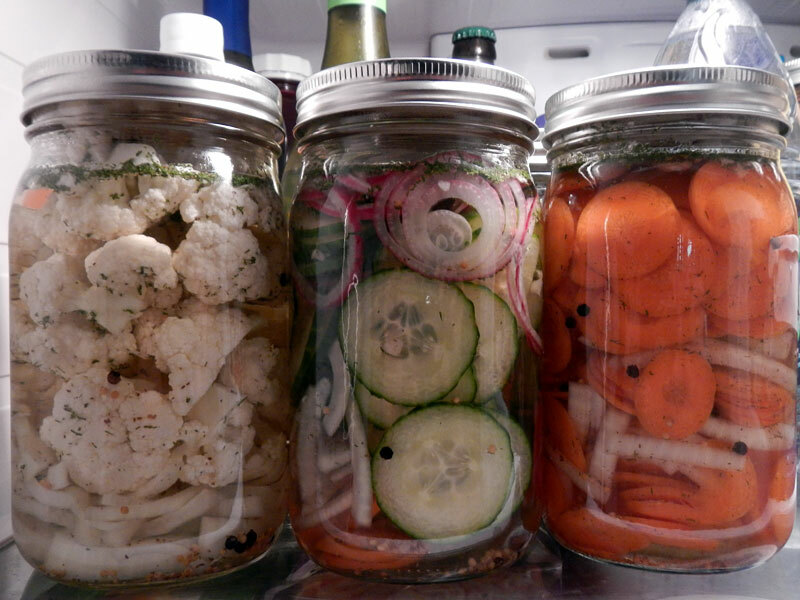 Start with your quart jar full of sliced veggies. If you are mixing kinds, it helps to layer them in the jar. I recommend organic vegetables for this one so that you aren’t creating a toxic soup. Non-organic cucumbers may have a coating on the outside to prolong the shelf life. You don’t really want to pickle that, do you? In a pinch, “English” or “hothouse” cucumbers will work. Add the following seasoning to each jar. Next you’re going to fill each jar up over the vegetables with the pickling liquid. I use the following ratio for mine. Mix up the liquid, and when the Stevia is dissolved completely, pour over the vegetables in the jar. The vegetables should be completely covered with the liquid. Cap tightly and place in the refrigerator. These need to marinate for a while, so wait at least 2 hours before eating. I can’t tell you how long they will keep in the refrigerator because the first jar we made disappeared in 48 hours. I did re-use the liquid by just adding more vegetables to it. Honestly, they don’t stick around long enough to worry about when you are eating them every day!